Most smartphone users think that their Android phones are less prone to infections from viruses, malware and other malicious software. However, most of the times like your computers and laptops, they are also exposed to threats from malicious websites, viruses and hackers. I was searching for an antivirus software that would offer assured protection to my Android mobile phone without affecting the performance and my wallet, and I found the Bitdefender Mobile Security as the right option for me. 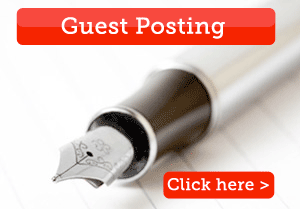 How to get started with Bitdefender Mobile Security? This software can be downloaded and taken for a free spin from the Google Play Store. The free version comes with 14 day trial period, and for enjoying its excellent features after that, you can get it either by subscribing monthly or annually. 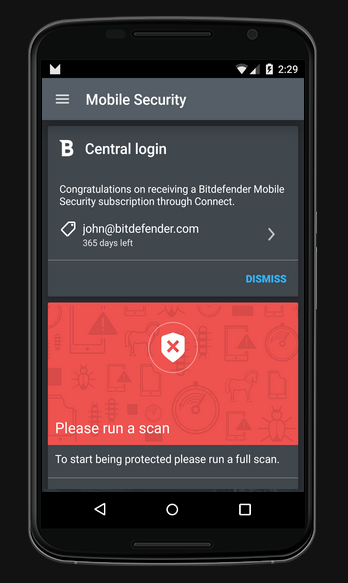 With the annual subscription, I got the license of the Bitdefender Mobile Security for Android. Bitdefender has won several software tests, like the AV-Test conducted by the German lab in July 2016 and scored 100% accuracy in malware detection. In the previous three evaluations, it has also performed consistently and was known for the best performance. Moreover, for 2 years in a row, it has also bagged PC Mag Editors’ Choice award which shows its efficiency. Bitdefender software lets the users browse without any worries of getting hacked. It also helps to stay away from threats of phishing and other viruses. The most interesting anti-theft feature stayed me off from all the worries of getting my phone stolen. You just need to register your mobile at the Bitdefender site, and by merely triggering the alarm it will tell you about the whereabouts of your phone, and even locks the phone up when a new SIM is inserted. This feature immediately tells me whether any app is leaking my private data online. Remote wipe is another appealing feature that helps you to keep your data safe when the phone is stolen. No information will be passed on to the wrong hands if someone lifts up your phone. The software is easy to use, and its interface looks straightforward and uncomplicated. Another big advantage is that the performance of the phone is no way hindered. It can detect malware so excellently without lessening the system performance even when I do a full system scan. This is a new feature that allows the phone to take a picture of the intruder who tries to turn the phone on in my absence. I also like this feature as it integrates my Android wear smartwatch with my phone. My smartwatch vibrates as soon as I get far away from the phone. Our review is not complete until we talk about the firewall protection offered by the software. For many of us, Android phones are replacing computers more and more. This means lots of info is transferred from our phones, which includes credit card details and bank transactions. Even texts and images can be manipulated if they reach the wrong hands. Firewall protection ensures that the information is safe. 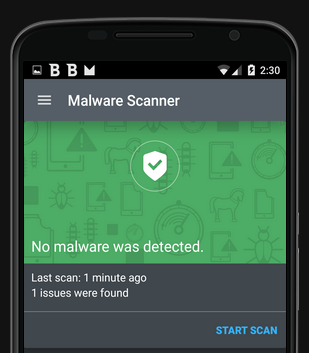 A malware check can be run on the phone to look for any existing malware. Users can choose to scan the entire device, the memory card, or the phone’s internal memory. With such alluring features and advantages, there is still some room for improvement with this antivirus software. There is no anti-spam feature offered by Bitdefender Mobile Security. This implies you cannot block the calls or messages that are unwanted. You also can’t create a backup of your data on the phone or using remote locations like a cloud. It also lacks encryptions and you can’t schedules scans to suit your requirements. We’d like to see more varied features implemented in future installments of the software. The fee is another area that comes under the list of cons. After the free trial period is over the users either need to move on by paying a monthly subscription of $1.49 or a yearly subscription of $15. The subscription covers only one device. Even for an additional device, there is no discount offer available. The price is reasonable for this reliable antivirus software. It scans faster and has a UI design that is simple and uncluttered. Virtually no impact on the performance of the device is the best advantage of choosing this compelling software. But it lacks features like not blocking spam messages and calls, and no offers for additional devices. However, finally, I can say that this highly performing software is certainly a good choice to keep my Android phone safe.